One of the greatest things about tea is that the flavor options are seemingly endless. Delicate white teas offer subtle, sweet flavor while robust black teas deliver rich, roasted taste. Green teas boast a vegetal and earthy flavor that contrasts with the stronger tastes of oolong teas or aged pu-erhs. 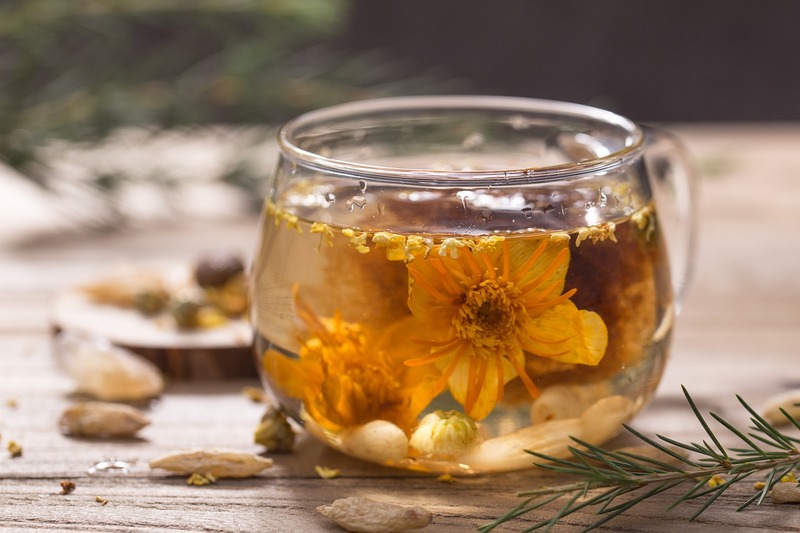 The world of flavor deepens with flavored teas that combine flowers, spices, and herbs with the classic true tea leaves. One of the most popular flavored teas is jasmine tea. Jasmine teas are typically created by scenting true teas made from the Camellia sinensis plant with delicate, fresh petals. 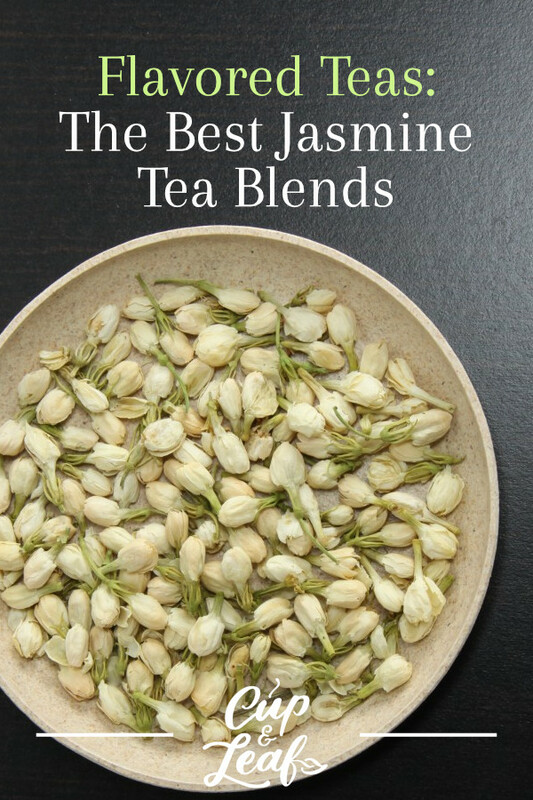 Jasmine tea can also be consumed as a stand alone tea using dried or fresh blossoms. 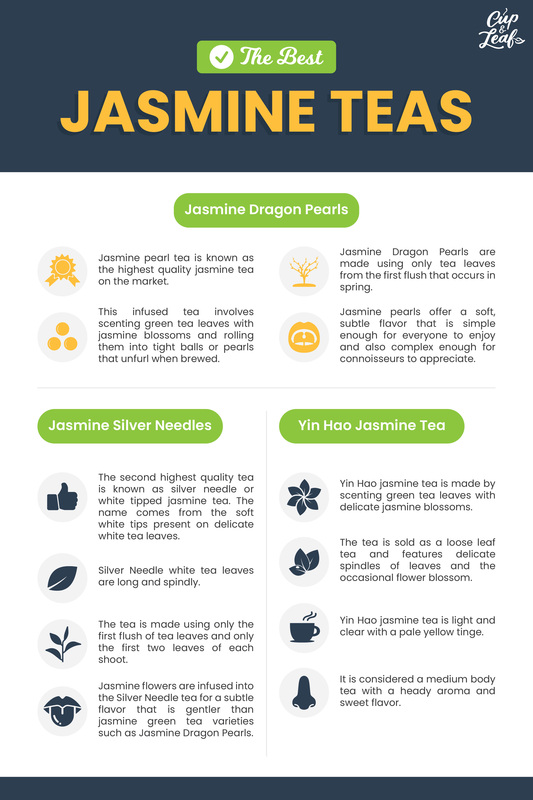 Here, we'll break down the flavor profile of jasmine tea and show you how to pick the best ones. Jasmine tea is an herbal tea that offers a delicate flavor that is most recognized for its lightly perfumed aroma. It is integral to Chinese tea culture and commonly served in Chinese restaurants and at family gatherings. Jasmine tea has been around for centuries and is widely consumed both in Asia and the western world today. The jasmine aroma is associated with calm and peace and can help you unwind after a long day. Jasmine tea is widely produced in the Fujian province of China. Small amounts of jasmine tea are also cultivated in Taiwan and on rare occasion in India and Bolivia. By and large, most jasmine teas on the market are cultivated and produced in mainland China. 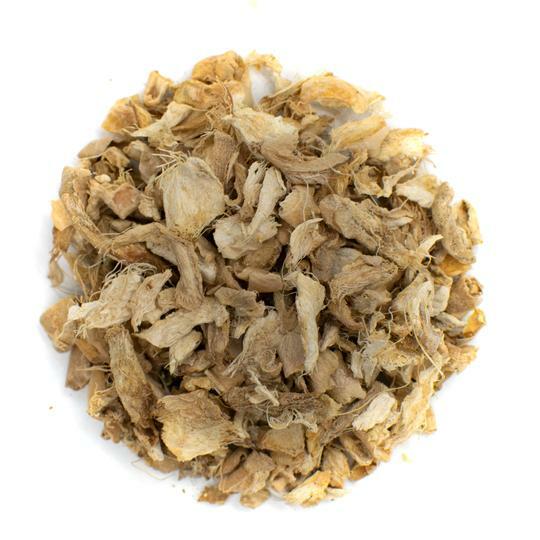 Jasmine tea is packed with antioxidants that offer health benefits and calming effects. 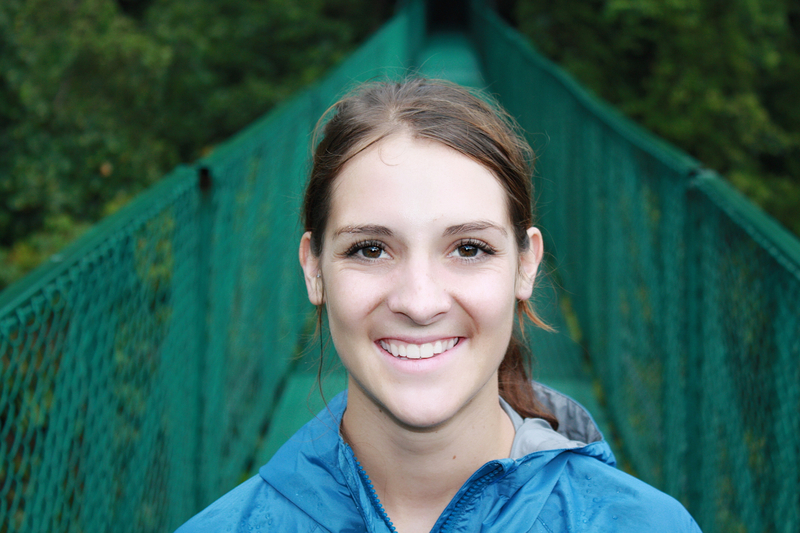 It's popular in traditional medicine as a way to improve overall well-being. There are two main ways jasmine tea is produced: the traditional way and the modern method. Traditionally jasmine scented tea involves a process where jasmine blossoms are added to tea leaves only to infuse aroma. The flowers are removed before packaging the tea leaves for sale. Traditional producers typically make jasmine green tea or jasmine white tea. The green tea leaves are harvested three to four times per year starting in early spring and ending in early autumn. The leaves harvested in spring and early summer and dried and preserved until the jasmine blossoms can be added for scenting. Jasmine flowers bloom in July and August. The fresh blossoms are added to the dried green tea leaves where the flower infuse flavor. Once the blossoms have lost their aroma, they are removed and new blossoms are added. The process can be repeated multiple times, with the highest quality jasmine teas consisting of 9 or 10 scentings. The modern method involves scenting the tea leaves using a jasmine oil or jasmine extract. Tea producers that use this method can opt for naturally produced additives and sell their teas as organic. The modern method enables producers to create larger batches of jasmine tea at faster rates. Higher quality jasmine teas typically use the traditional scenting method. Once the tea leaves are scented or infused with jasmine blossoms, they are sorted and packaged into loose leaf teas or tea bags. Broken tea leaves, dust, and fannings are packaged as tea bags. Whole tea leaves are graded for quality and packaged as loose tea. 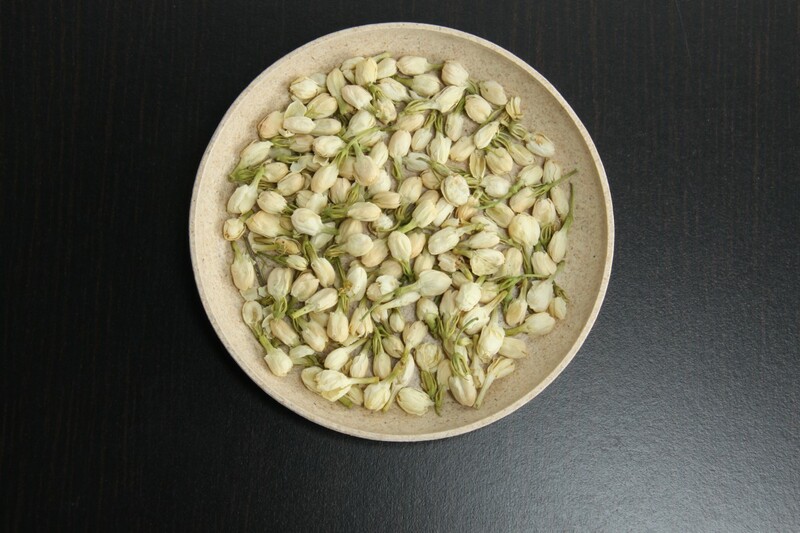 Most jasmine teas remove the jasmine flowers before sale, but some varieties leave the dried blossoms in. Jasmine teas are also available as jasmine pearls, cakes, and balls. Jasmine pearl tea is known as the highest quality jasmine tea on the market. This infused tea involves scenting green tea leaves with jasmine blossoms and rolling them into tight balls or pearls. The meticulous rolling process produces tight tea balls that slowly unfurl when they are brewed. This type of jasmine tea is delicious and offers a visual treat during preparation. Jasmine Dragon Pearls are made using only tea leaves from the first flush that occurs in spring. These leaves feature downy, white tips and a tender flavor. 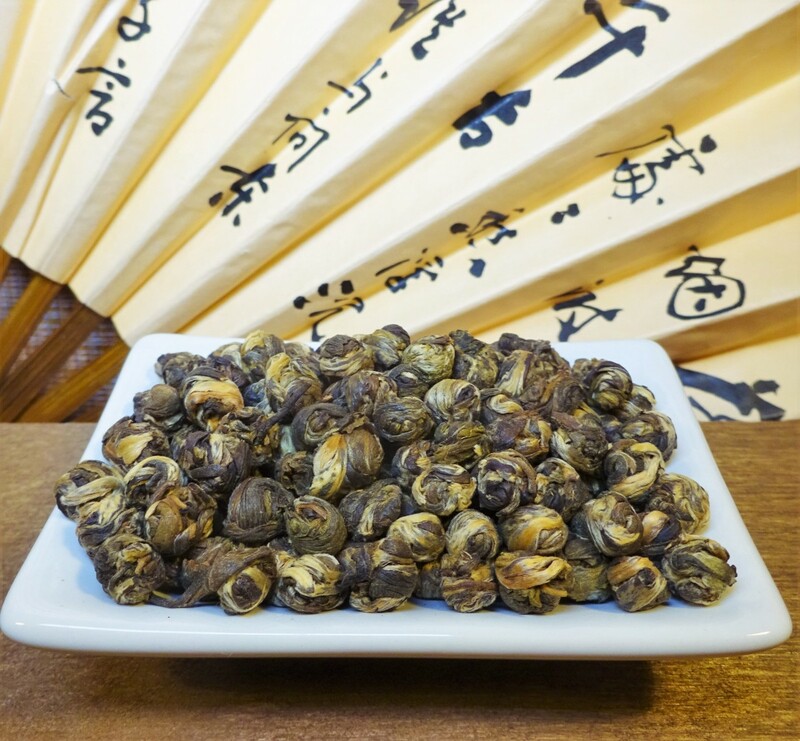 Jasmine pearls offer a soft, subtle flavor that is simple enough for everyone to enjoy and also complex enough for connoisseurs to appreciate. 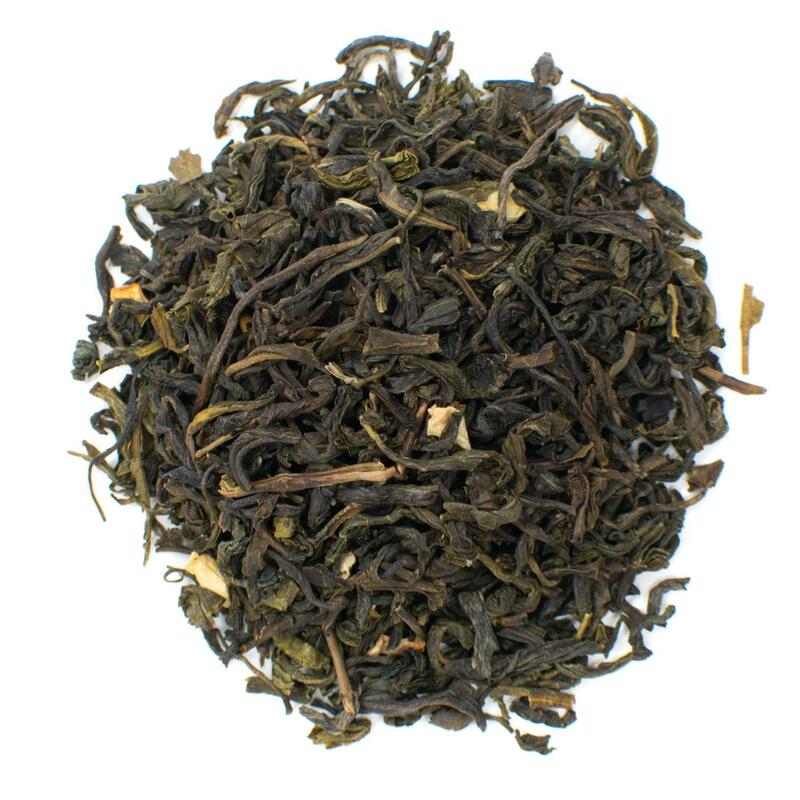 Our Jasmine Green with Flowers comes from the Fujian province and is the perfect blend of quality and price. The second highest quality tea is known as silver needle or white tipped jasmine tea. 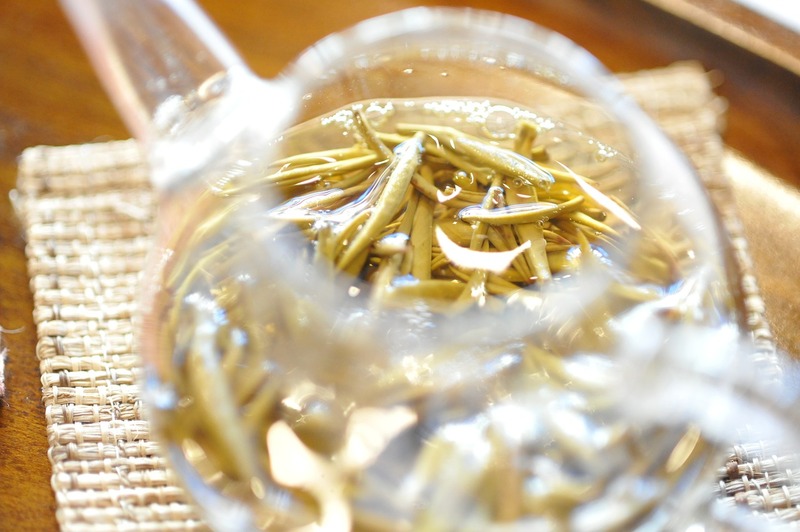 The name comes from the soft white tips present on delicate white tea leaves. Silver Needle white tea leaves are long and spindly. They are made using only the first flush of tea leaves and consist only of the first two leaves of each shoot. Jasmine flowers are infused into the Silver Needle tea for a subtle flavor that is gentler than jasmine green tea varieties such as Jasmine Dragon Pearls. Yin Hao jasmine tea is made by scenting green tea leaves with delicate jasmine blossoms. The tea is sold as a loose leaf tea and features delicate spindles of leaves and the occasional flower blossom. Yin Hao jasmine tea is light and clear with a pale yellow tinge. 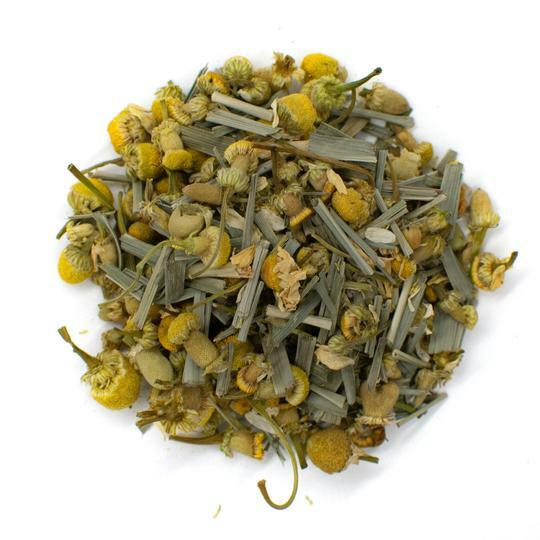 It is considered a medium body tea with a heady aroma and sweet flavor. Jasmine tea is a delicate tea that is often blended with delicate tea leaves such as green tea and white tea. That means extra care has to be taken when brewing jasmine tea to avoid bitter flavors. Loose leaf organic tea is best as it avoids chemicals and contaminants that can alter flavor. Jasmine tea should be brewed around 175 F using spring, pure, or filtered water. Use a temperature controlled tea kettle for the most accurate results or simply boil water and let it sit for two minutes before adding the jasmine tea. Jasmine tea is traditionally served in lidded cups called gaiwans, but also commonly brewed in 8-ounce glass tea cups. You can use any cup you prefer, but make sure it is made either of glass or ceramic for the best flavor. Rinse your cup with a small amount of hot water before adding 2 teaspoons of jasmine and tea leaves. Fill the gaiwan with hot water and cover with a lid. Steep for 1 to 2 minutes and enjoy! Jasmine tea leaves can generally be infused 3 to 5 times depending on preferred flavor and strength. You can also brew jasmine tea using a tea kettle, tea cup, fresh blossoms, and a tea infuser. Harvest jasmine blossoms from your garden and add them to dried tea leaves such as green tea of oolong tea. Heat the tea kettle to 175 F and pour into your cup. Add the jasmine and tea leaves to a tea infuser such as a tea ball and place in the hot water. Steep for 1 to 2 minutes before removing the infuser. Enjoy your fresh jasmine blossom tea! Whether you're a seasoned tea lover or a beginner looking to try new flavors, jasmine tea is a universal favorite. High quality jasmine teas offer depth and complex flavor profiles to delight the most seasoned tea tasters. Tea drinkers in Asia have enjoyed the sweet aroma and flavor for centuries. The soft, sweet flavor makes it suitable for beginners who are just getting an introduction to the tea world. Drink it as an iced tea to cool down in summer or warm up with a hot cup in winter. 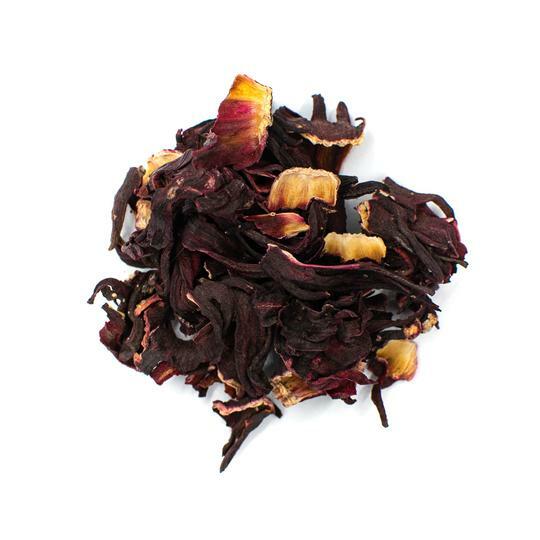 This delicate floral tea is guaranteed to become one of your new favorite teas.